Last week, the red carpet premiere of "Crazy Rich Asians" shut down a small stretch of Hollywood Boulevard. 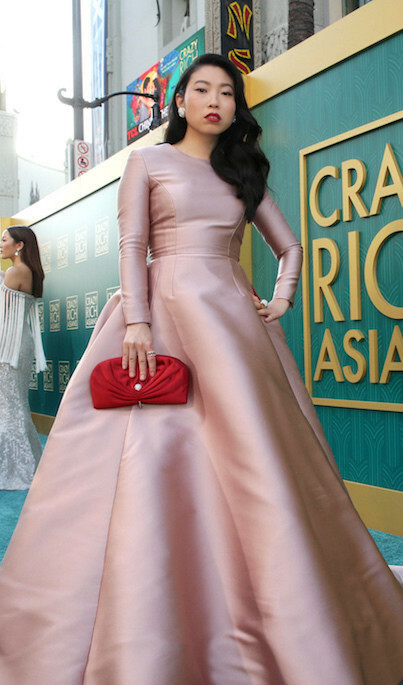 The stars of "Crazy Rich Asians" were glamorously dressed and graciously posed for selfies with the fans in the lobby because they understand this is a community effort: Asian Americans taking on Hollywood and whitewashing in the city where the largest mass lynching in American history took place (Chinese massacre of 1871). When director Jon M. Chu came out with author Kevin Kwan to intro the film, the tone was one of a shared journey but we're only half-way there. Actors and audience were forming a conspiratorial allegiance against the TV and movie establishment and extending gratefulness to the "Crazy Rich Asians" production companies and to the distributor, Warner Bros. At the end of the movie, after walking past stone lions, there were elegant faux Louis XIV seating set against backgrounds advertising "Crazy Rich Asians" and attendees could take selfies and share their reactions to the movie. The plaza of cement signatures, handprints and footprints of Hollywood's favorite stars in front of the theater had become a social media making hub. In July, while waiting for a non-related press conference in San Diego to begin, an older Asian-American journalist opined that topic of the film seemed frivolous. Compared to Spike Lee's "BlacKkKlansman" that's true, and there's no fighting or superhero mythology behind "Crazy Rich Asians." The book is a gossipy rom-com stew spiced with food and fashion, but even Asians and ethnic Asians deserve to slip into other cinematic genres; for Asians it's been a long bitter drought. 25 years ago, Amy Tan's book, "The Joy Luck Club" was produced by Hollywood Pictures and distributed by Buena Vista. That English-Mandarin language film was a success but it was not enough to convince other studios to invest in stories and give Asian Americans, particularly Asian American men leading roles. This might be 2018, but Asian American men are overlooked for roles even in regions where they should be the logical choice: a state where Asians make up 58 percent of the population and has had and currently has an ethnic Asian governor ("Hawaii Five-0" and the reboot of "Magnum P.I.") or in real-life stories ("21") or in super-hero stories based in Asia and the Pacific ("Doctor Strange" and "The Last Airbender"). Too often, Asian American actors are relegated to the sidekick: Think of the San Francisco-born Bruce Lee as Kato in "The Green Hornet" in 1967 and UK-born Benedict Wong in "Doctor Strange" in 2016. "Crazy Rich Asians" doesn't exoticize the women like "Memoirs of a Geisha," so heterosexual men with yellow fever might be disappointed, but there are a few shirtless scenes where the beauty of the Asian male body is celebrated. There is also a moment early in "Crazy Rich Asians" that seems to be a raspberry at "21" and another parallel scene toward the end that seems to be a respectful nod to "The Joy Luck Club." There's been some criticism that Eurasians were prominently cast. Sonoya Mizuno is Japanese, British and Argentinian. Lead actor Golding is Malaysian Iban and English. Gemma Chan is Chinese-Scottish. That didn't seem to be a big issue with the audience and all three could pass although this isn't a story about passing. Asian Americans have actively fought for their Civil Rights, but you rarely hear about it. Those are stories yet to be told. "Crazy Rich Asians," on the surface, is a lightweight rom-com that might leave foodies salivating but the movie has become a movement. After all, Asian cuisines have become an accepted part of the American lifestyle—and profitable, too (Aloha Poke); but when will ethnic Asians—male and female, find acceptance on the big screen and beyond in America? There was some irony in celebrating a movie about Chinese Singaporeans at the TCL Chinese Theatre. Sid Grauman followed up his successful Egyptian Theatre down the street with this 1926 Chinese inspired theater. The Chinese Exclusion Act had already made clear that the ordinary Chinese person was not welcome in the United States and California had been anti-Chinese and anti-Asian long before that. Randolph Hearst (1863-1951), who inspired the main character of Orson Welles' "Citizen Kane," was known for his anti-Asian views and yet a few decades after his death, his San Francisco Examiner was for a while owned by the Fang family (before it was passed to Clarity Media and then San Francisco Newspaper Company LLC). Grauman's Chinese Theater was briefly Chinese Mann before it became the Telephone Communication Limited Corporation, TCL, Chinese in 2013. Back at the Chinese-owned historic Chinese Theatre, two massive stone lions statues guarded both sides of the main entrance as that night's royalty, guests and lucky ticket holders entered. Above the door is a Chinese dragon. Dragons decorate the red interior and ornate ceilings. I suspect that many in Tuesday night's audience had a feeling of recognition during the scene of the hotel snub, a sweet revenge that plays out as a type of fantasy. Yet I suppose there's also some sweet revenge in this movie about powerful Asians with an all-Asian cast premiering at the now Chinese-owned Chinese Theatre. Enough that one should pause to party before pushing ever forward on this long journey toward acceptance.